Once you have chosen your custom design and the preferred material, you can now take a look at where you want to place your house sign. Freestanding signs look great and can be placed at the end of a driveway or onto a parks lawn to show directions or to name the chosen place. Signs attached to posts look traditional and are easy to read. Mounting your sign onto a fence or the wall to your building gives off a professional look as well as saving space. We will now take a look at various ways to mount a sign. Screw fixtures are great to mount a plaque style sign to a wall because when done correctly the installation is sturdy and will withstand the wind. Screws can be placed through the sign on each side, 5mm holes can be drilled into the wall, and the sign can be fixed. This type of fixture can be used on stone, wood, acrylic, vinyl and more. Research on stricter material such as stone will need to be done to make sure that the sign is not cracked in any way. 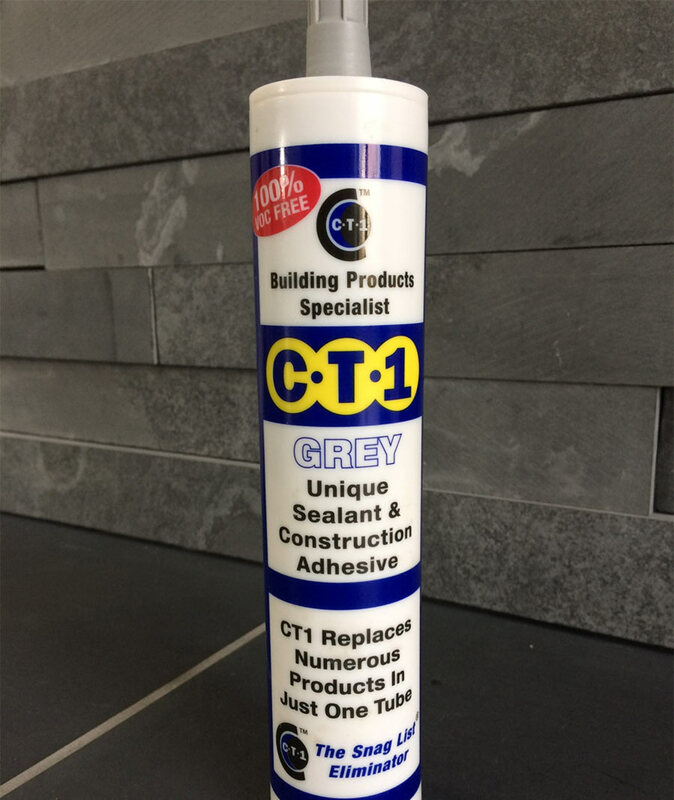 Bond fixing will avoid screwing into a sign which prevents cracking and splitting, should it be installed incorrectly. When using an adhesive glue the sign into place, all fixtures are hidden giving the sign a professional look. You can place a small mount at the back of the sign which provides a fantastic 3d effect to all that look at it. Bond fixtures are great for attaching a sign to a fence post and will last over time. These fixtures are used on doors too due to their durability such as cafes using them on toilet doors. 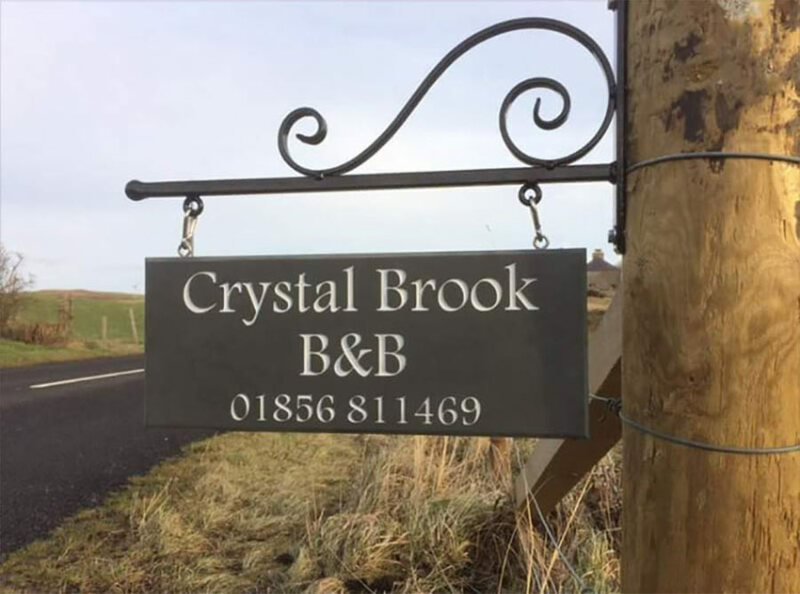 Grounded house or business signs allow you to place it wherever is best for you and will also allow you to decorate around it with flowering or stones. Depending on the type of stone sign, you may be able to position it on the grass in your front garden. 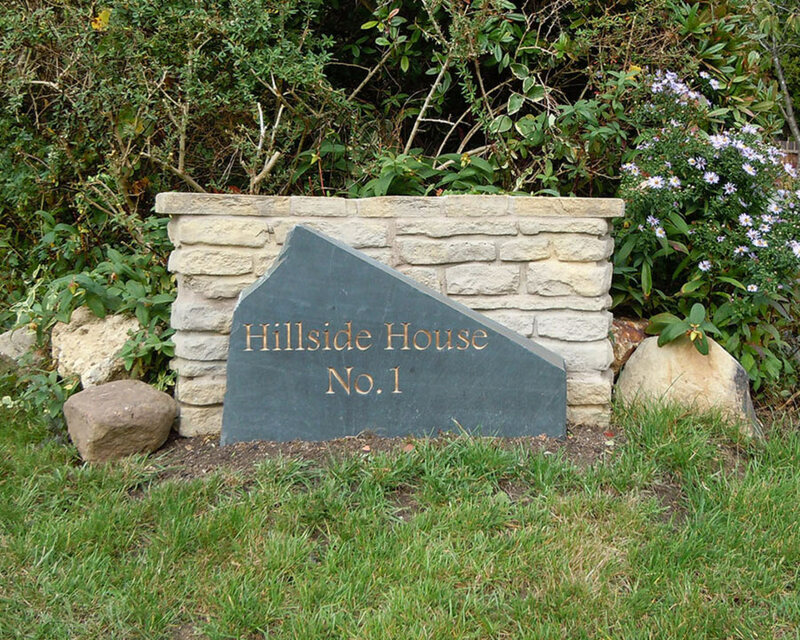 Plaque style signs can be fitted onto a stake and then set into the ground either by concrete or into the grass. Concrete signs are also a great alternative sign for outside as you can design this with your pathway. You could have Hollywood stars naming your family. 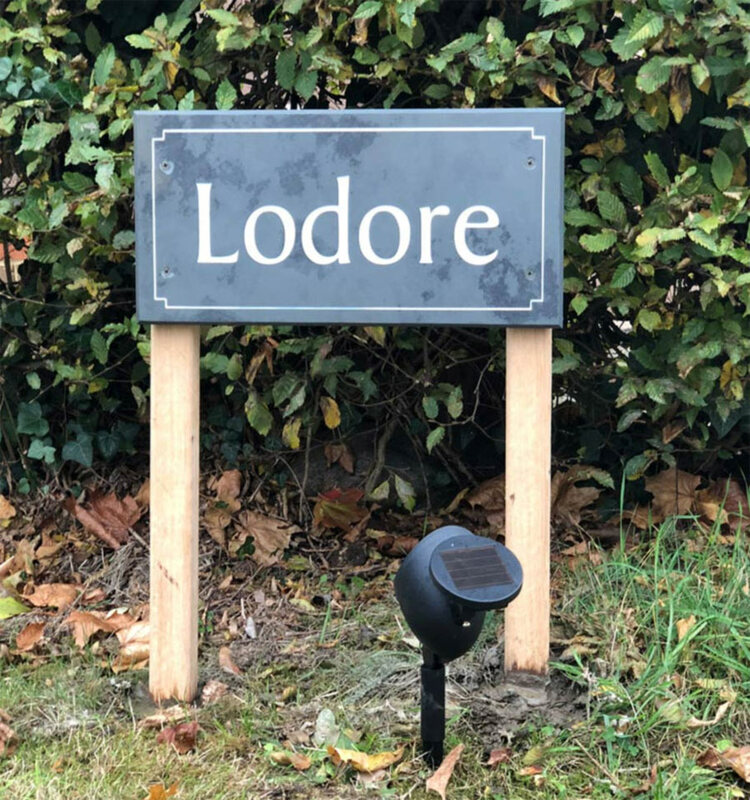 Signposts can give you a traditional and beautiful look to your property. Posts can either be made from wood or metal. Your sign can be bond fixed to these posts or can be attached, so they hang and swing slightly by using stainless eye hooks. These posts are great for directions as you can have a few routes on each post, creating more space within your land. Hanging a sign, traditionally, above a pub or museum door can give a professional look and are easy to fix. 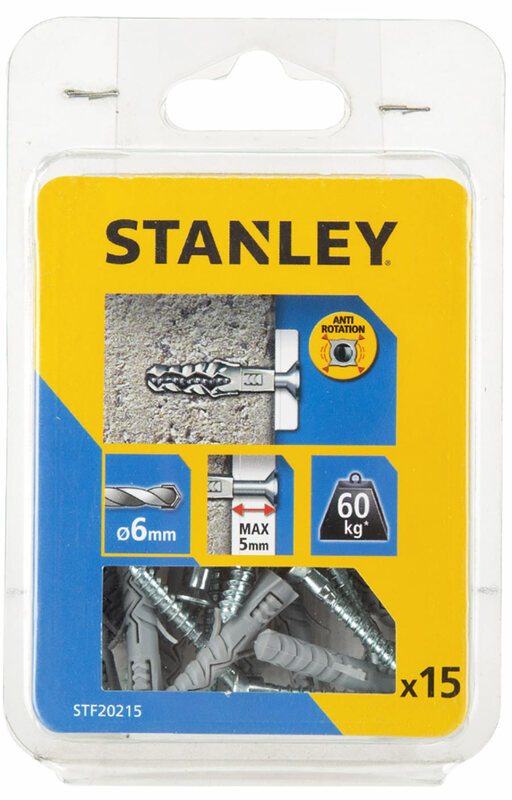 By using stainless eye hooks your sign can be hooked onto the fixture. Hanging a sign from a post will also give you a great look as well as being easy to read and double-sided.